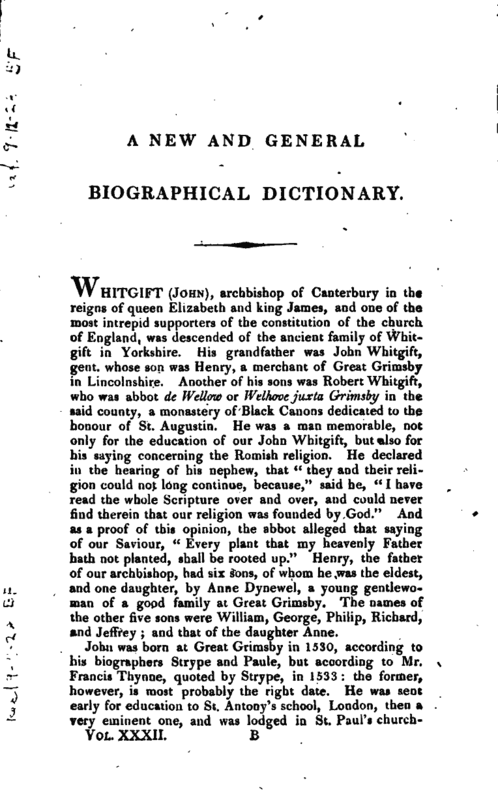 , archbishop of Canterbury in the reigns of queen Elizabeth and king James, and one of the most intrepid supporters of the constitution of the church, of England, was descended of the ancient family of Whitgift in Yorkshire. His grandfather was John Whitgift, gent, whose son was Henry, a merchant of Great Grimsby in Lincolnshire. Another of his sons was Robert Whitgi ft, who was abbot de Wellow or Welhove juxta Grimsby in the said county, a monastery of Black Canons dedicated to the honour of St. Augustin. He was a man memorable, not only for the education of our John Whitgift, but also for his saying concerning the Romish religion. He declared in the hearing of his nephew, that “they and their religion could not long continue, because,” said he, “I have read the whole Scripture over and over, and could never find therein that our religion was founded by God.” And as a proof of this opinion, the abbot alleged that saying of our Saviour, “Every plant that my heavenly Father hath not planted, shall be rooted up.” Henry, the father of our archbishop, had six sons, of whom he was the eldest, and one daughter, by Anne Dy newel, a young gentlewoman of a good family at Great Grimsby. The names of the other five sons were William, George, Philip, Richard, and Jeffrey; and that of the daughter Anne. He now returned home to his father in Lincolnshire; and his uncle, the abbot, finding that he had made some progress in grammatical learning, advised that he should be sent to the university. Accordingly he entered of Queen’s college, Cambridge, about 1548, but soon after removed to Pembroke- hall, where the celebrated John Bradford, the martyr, was his tutor. He had not been here long before he was recommended by his tutor and Mr. Grindal (then fellow, and afterwards archbishop of Canterbury) to the master, Nicholas Ridley, by which means he was made scholar of that house, and chosen bibleclerk. These advantages were the more acceptable to him, as his father had suffered some great losses at sea, and was less able to provide for him. 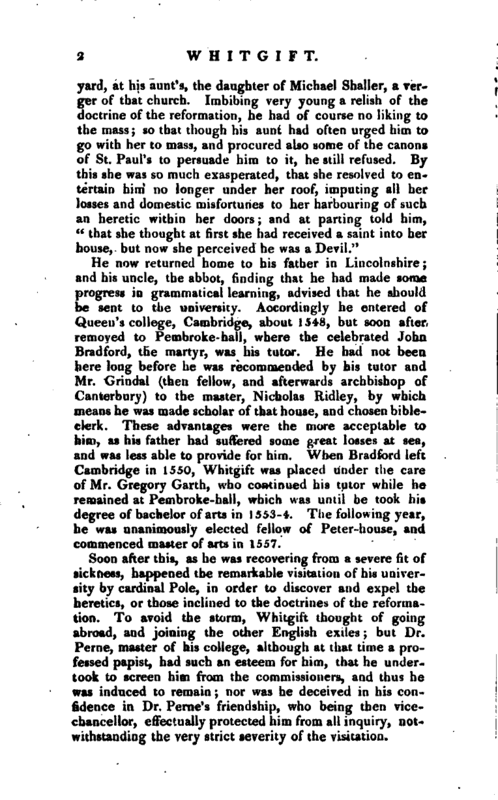 When Bradford left Cambridge in 15.50, Whitgift was placed under the care of Mr. Gregory Garth, who continued his tutor while he remained at Pensbroke-hall, which was until he took his degree of bachelor of arts in 1553-4. The following year, he was unanimously elected fellow of Peter-house, and commenced master of arts in 1557. Soon after this he joined his brother professor, Hutton, and several heads of colleges, in a petition to sir William Cecil, their chancellor, for an order to regulate the election of public officers, the want of which created great disturbance in the university at that time. Two years after this he distinguished himself so eminently in the pulpir, that sir Nicholas Bacon, then lord- keeper, sent for him to court to preach before the queen, who heard him with great satisfaction, and made him her chaplain. 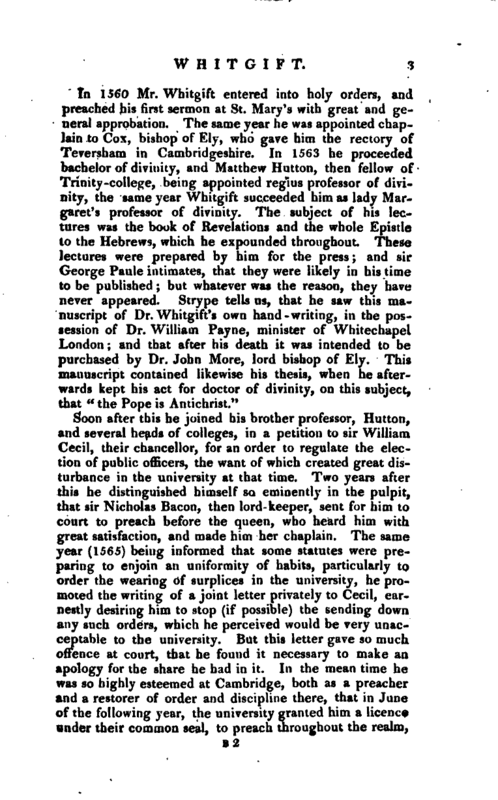 The same year (1565) being informed that some statutes ‘were preparing to enjoin an uniformity of habits, particularly to order the wearing of surplices in the university, he promoted the writing of a joint letter privately to Cecil, earnestly desiring him to stop (if possible) the sending down any such orders, which he perceived would be very unacceptable to the university. But this letter gave so much offence at court, that he found.it necessary to make, an apology for the share he had in it. In the mean time he was so highly esteemed at Cambridge, both as avpreacher and a restorer of order and discipline there, that in June of the following year, the university granted him a licence under their common seal, to preach throughout the realna, | and in July following the salary of his professorship was raised, out of respect to him, from twenty marks to twenty pounds. He had the year before been a considerable benefactor to Peter-house, where, in 1567, he held the place of president, but was called thence in April to Pembroke-hall, being chosen master of that house, and not long after was appointed regius professor of divinity. In both these prejfertnents he succeeded his old frrend Dr. Hutton, now made dean of York, and to the first was recommended, as Dr. Hutton had been, by Grindal, then bishop of London. But he remained at Pembroke-hall only about three months, for upon the death of Dr. Beauchamp, the queen promoted him to the mastership of Trinity-college. This place was procured for him, chiefly by the interest of sir William Cecil, who, notwithstanding some objections had been made tq his age, secured the appointment. The same year he took his degree of doctor in divinity; and in 1570, having first applied to Cecil for the purpose, he compiled a new body of statutes for the university, which were of great service to that learned community. 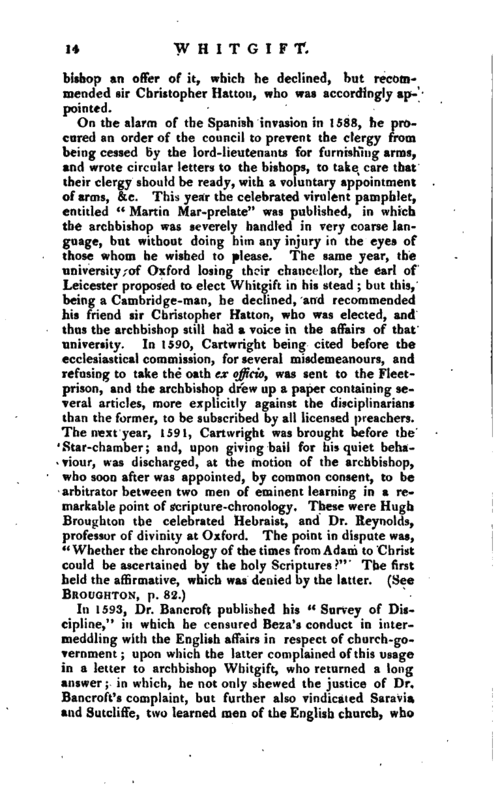 This work he finished in August, and the same month was the principal agent in procuring an order from the vice-chancellor and heads of houses, to prohibit the celebrated Cartwright (See Cartwright), who was now Margaret professor, from reading any more lectures without some satisfaction given to them of his principles and opinions. Dr. Whitgift informed the chancellor of this step, and at the same time acquainted him with Cartwright’s principles, and the probable consequences of them, on which he received the chancellor’s approbation of what had been done. Cartwright, having refused to renounce his opinions, was deprived of his professorship; but as he gave out that those opinions were rather suppressed by authority, than refuted by reason, Dr. Whitgift took an effectual method to remove that objection. At the chancellor’s request, he wrote a confutation of some of the chief of Cartwright’s sentiments, and sent them to archbishop Parker, in a letter dated Dec. 29, with an intention to publish them, which, however, was not done untii afterwards when they were combined in his “Answer to the Admonition, &c.” hereafter noticed. In 1671 Dr. Whitgift served the office, of vice-chancellor. The same year an order was made by the archbishop | and bishops, that all those who had obtained faculties to preach, should surrender them before the third of August; and that upon their subscription to the thirty-nine articles, and other constitutions and ordinances agreed upon, new licences shouldbe granted. This being signified to the university, and an order sent, requiring them to call in all the faculties granted before, Whitgift surrendered his former licence, obtained in 1566, and had another granted him in September 1571, in which he was likewise constituted one of the university preachers. In June, in consequence of the queen’s nomination, he had been appointed dean of Lincoln, and in October the archbishop granted him a dispensation to hold with it his prebend of Ely and rectory of Teversham, and any other benefice whatsoever; but in the following year he resigned the rectory of Teversham. 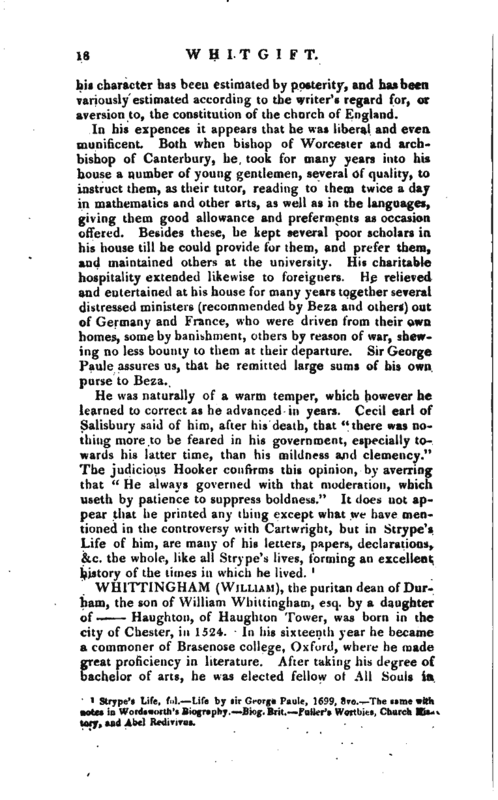 He was now, by particular appointment from the archbishop of Canterbury, writing his “Answer to the Admonition,” which requiring more leisure than his office as master of Trinity college could admit, he desired to leave the university, but this the ’other heads of houses succeeded in preventing. He had a little before expelled Cartwright from his fellowship for not taking orders in due time, according to the statute; and before the expiration of the year 1572 published his “Answer to the Admonition to the Parliament,” 4to. The “Admonition” was drawn up by Field, minister of Aldermary, London, and Mr. Wilcox. As archbishop Parker was the chief person who encouraged Whitgift to undertake the “Answer,” he likewise gave him considerable assistance, and other prelates and learned men were also consulted, and every pains taken to make it, what it has been generally esteemed, as able a defence of the Church of England against the innovations of the puritans, as bishop Jewel’s was against the doctrines of the Church of Rome. A second edition appeared in 1573, with the title “An answer to a certain libel, entitled An Admonition to the Parliament, newly augmented by the author, as by conference shall appear.” To this a reply being published by Cartwright, Dr. Whitgift published his defence, fol. 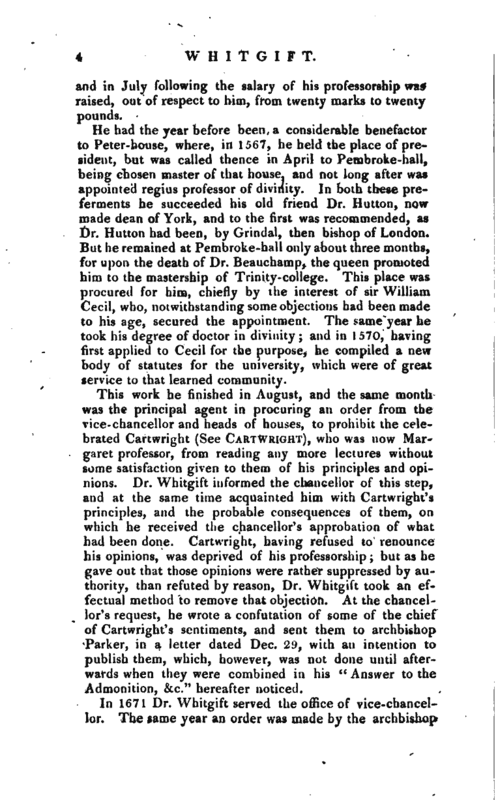 1574, Cartwright published in 1574, 4to, “The second Reply of T. C. against Dr. Whitgift’s second Answer touching Church-Discipline.” What the opinion of Dr. Whitaker, who was thought to be a favourer of puritawsm, was concerning tjiis book of Mr. Cartwright, will | appear from the following passage in a Latin letter of his preserved by Dr. Richard Bancroftand sir George Paule in his “Life of archbishop Whitgift.” “I have read a great part of that book, which Mr. Cartwright hath lately published. I pray God I live not, if I ever saw any thing more loosely written, and almost more <$ildishly. It is true, that for words he hath great store, and those both fine and new; but for matter, as far as I can judge, he is altogether barren. Moreover, he doth not only think per-r versely of the authority of princes in causes ecclesiastical, but also flyeth into the papists holds, from whom he would be thought to dissent with <a. mortal hatred. But in this point he is not to be endured, and in other points also h& borroweth his arguments from the papists. To conclude, as Jerom said of Ambrose, he playeth with words, and is lame in his sentiments, and is altogether unworthy to be confuted by any man of learning.” And Whitgift, being advised by his friends to let Cartwright’s “Second Reply” pass as unworthy of his notice, remained silent. About the same time, Dr. Whitgift appeared in opposition to a design then meditated, for abolishing pluralities, and taking away the impropriations and tithes from bishops and spiritual (not including temporal) persons, for the better provision of the poorer clergy. He did not, howv ever, proceed farther in this than to express his sentiments in private to the bishop of Ely, who had proposed the scheme, which does not appear to have been brought for-r ward in any other shape, probably in consequence of the arguments he advanced against it. In March 1577 he was made bishop of Worcester; and as this diocese brought him into the council of the marches of Wales, he was presently after appointed vice-president of those marches in the absence of sir Henry Sidney, lord president, and now lord-lieutentxnt of Ireland. 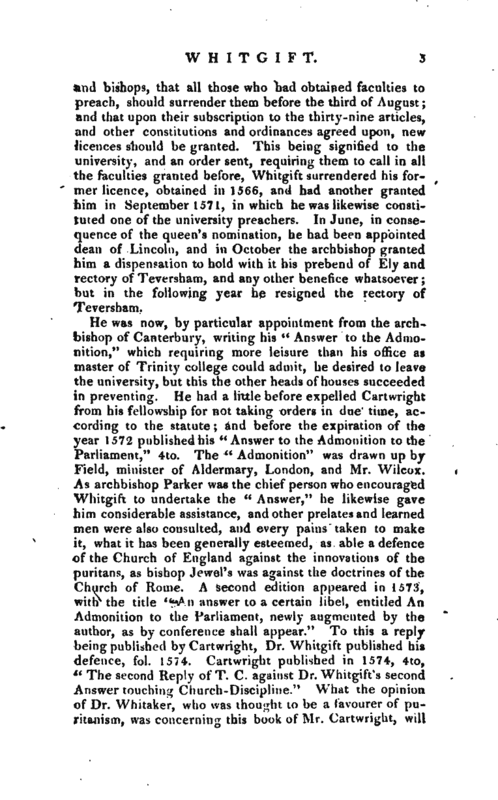 In June following he resigned the mastership of Trinity college; and just before procured a letter from the chancellor, in order to prevent the practice then in use, of taking money for the resignation of fellowships. 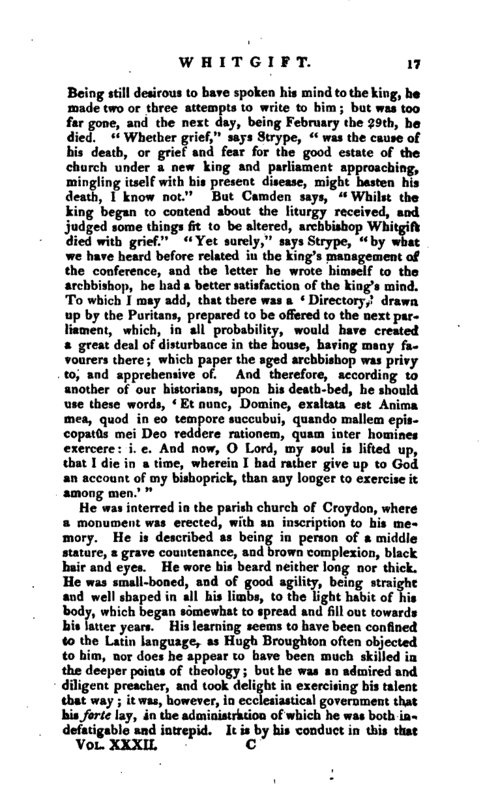 The queen, as we noticed in our account of archbishop Grindal, had some thoughts of placing Whitgift in that worthy prelate’s room, even in his life-time, and Grindal certainly would have been glad to resign a situation in which his conduct had not been acceptable to the court, and he had at the same time such an opinion of Whitgift | as to be very desirous of him for a successor. But Whitgift could not be prevailed upon to consent to an arrangement of this kind, and requested the queen would excuse his acceptance of the office on any terms during the life of Grindal. Grindal, however, died in July 1533, and the queen immediately nominated Whitgift to succeed him as archbishop of Canterbury. On entering on this high office he found it greatly over-rated as to revenues, and was obliged to procure an order for the abatement of lOOl. to him and his successors, on the payment of first fruits, and he shortly after recovered from the queen, as part of the possessions of the archbishopric, Long-Beach Wood, in Kent, which had been many years detained from his predecessor by sir James Croft, comptroller to her majesty’s household. But that in wbich he-was most concerned was to see the established uniformity of the church in so great disorder as it was from thenon-compliance of the puritans, who, taking advantage of his predecessor’s easiness in that respect, were possessed of a great many ecclesiastical benefices and preferments, in which they were supported by some of the principal men at court. He set himself, therefore, with extraordinary zeal and vigour, to reform these infringements of the constitution, for which he had the queen’s express orders. With this view, in December 1583, he moved for an ecclesiastical commission, which was soon after issued to him, with the bishop of London, and several others. For the same purpose, in 1584, he drew up a form of examination, containing twenty-four articles, which he sent to the bishops of his province, enjoining them to summon all such clergy as were suspected of nonconformity, and to require them to answer those articles severally upon oath, ex officio mero, likewise to subscribe to the queen’s supremacy, the book of Common Prayer, and the thirty-nine articles. To this the archbishop sent an answer, dated July 3, to the following purport That, as touching the twenty-four articles, which his lordship seemed so much to dislike, as written in a Romish style, and smelling of the Romish inquisition, he marvelled at his lordship’s speeches, seeing it was the ordinary course in other courts, as in the starchamber, the courts of the marches, and other places; and that the objection of encouraging the papists by these courses, had neither probability nor likelihood. That as to his lordship’s speech for the two ministers, viz. that they were peaceable, observed the book, denied the things wherewith they were charged, and desired to, be tried, the | archbishop demanded, now they were to be tried, why they did refuse it qui male egit odit lucem? That the articles he administered unto them were framed by the most learned in the laws, and who, he dared to say, hated both the Romish doctrine and Romish inquisition; and that he ministered them to the intent only that he might truly understand whether they were such manner of men, or no, as they pretended to be, especially, seeing by public fame they were noted of the contrary, and one of them presented by the sworn men of his parish for his disorders, as he was informed by his official there. That time would not serve him to write much; that he referred the rest to the report of the bearer, trusting his lordship would consider of things as they were, and not as they seeded to be, or as some wonld have them; that he thought it high time to put those to silence who were and had been the instruments of such great discontentment as was pretended; that conscience was no more excuse for them than it was for the papists or anabaptists, in whose steps they walked. 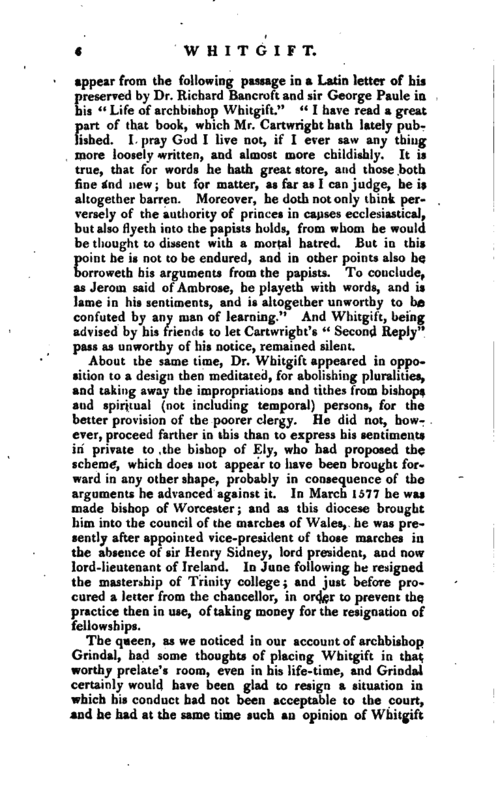 He knew, he said, that he was especially sought, and many threatening wordscame to his ears to terrify him from proceeding; that the bishop of Chester (Chaderton) had wrote to him of late, and that in his letter a little paper was inclosed, the copy whereof he sent to his lordship; “You know (said the archbishop) whom he knoweth; but it moves me not; he can do no more than God will permit him. It is strange to understand what devices have beert used to move me to be at some men’s becks;” the particularities of all which he would one day declare to his lordship, and added, that he was content to be sacrificed in so good a cause, “which I will never betray nor give over, God, her majesty, all the laws, my own conscience and duty, being with me.” He concludes with beseeching Burleigh not to be discomfited, but continue; the cause was good, and the complaints being general, were vain, and without cause, as would appear when they descended to particularities. To encourage his lordship farther, the archbishop, on June 24, sent him a schedule of the number of; puritan preachers in his province, with their decrees, confronting them with the nonconformists, by which it appeared that there were seven hundred and eighty-six conformists, and only forty-nine recusants. 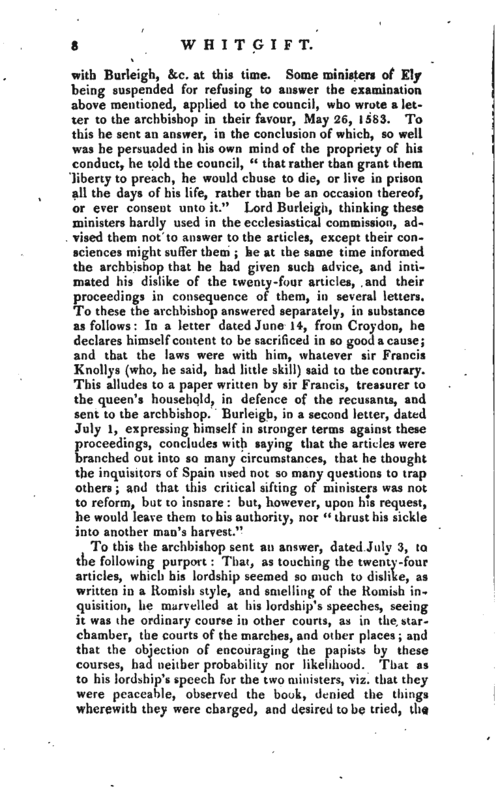 Lord Burleigh, in another letter, still insisting that he | would not call his proceedings rigorous and captious, but that they were scarcely charitable, the archbishop sent him, July 15, a defence of his conduct in a paper entitled “Reasons why it is convenient that those which are culpable in the articles ministered judicially by the archbishop of Canterbury and others, her majesty’s commissioners for causes ecclesiastical, shall be examined of the same articles upon their oaths.” In this paper he maintained, 1. That by the ecclesiastical laws remaining in force, sucli articles may be ministered: this is so clear by all, that it was never hitherto called into doubt, 2. That this manner of proceeding has been tried against such as were vehemently suspected, presented, and detected by their neighbours, or whose faults were notorious, as by open preaching, since there hath been any law ecclesiastical in this realm. 3. For the discovery of any popery it hath been used in king Edward’s time, in the deprivation of sundry bishops at that time, as it may appear by the processes, although withal for the proof of those things that they denied, witnesses were also used. 4. 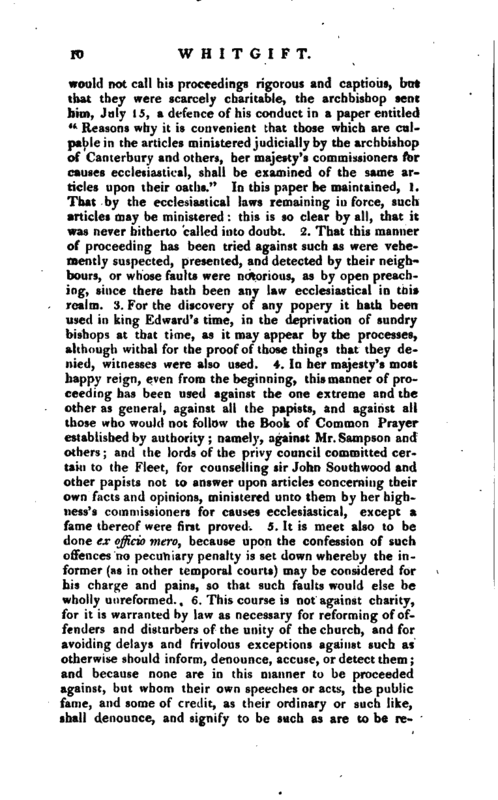 In her majesty’s most happy reign, even/rom the beginning, this manner of proceeding has been used against the one extreme and the other as general, against all the papists, and against all those who would not follow the Book of Common Prayer established by authority; namely, against Mr. Sampson and others; and the lords of the privy council committed certain to the Fleet, for counselling sir John Southwood and other papists not to answer upon articles concerning their own facts and opinions, ministered unto them by her highness’s commissioners for causes ecclesiastical, except a fame thereof were first proved. 5. It is meet also to be done ex officio mero, because upon the confession of such offences no pecuniary penalty is set down whereby the informer (as in other temporal courts) may be considered for his charge and pains, so that such faults would else be wholly unreformed. 6. 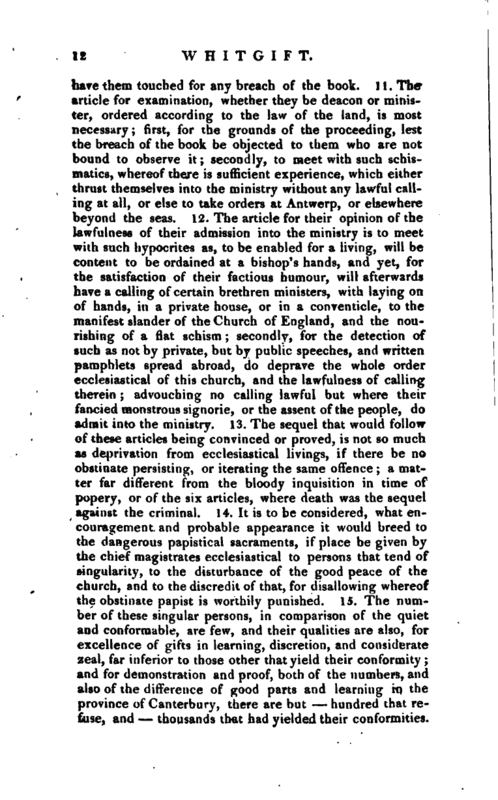 This course is not against charity, for it is warranted by law as necessary for reforming of offenders and disturbers of the unity of the church, and for avoiding delays and frivolous exceptions against such as otherwise should inform, denounce, accuse, or detect them; and because none are in this manner to be proceeded against, but whom their own speeches or acts, the public fame, and some of credit, as their ordinary or such like, shall denounce, and signify to be such as are to be | reformed in this behalf. 7. That the form of such proceedings by articles ex officio mero is usual; it may appear by all records in ecclesiastical courts, from the beginning; in all ecclesiastical commissions, namely, by the particular commission and proceedings against the bishops of London and Winton, in king Edward’s time, and from the beginning of her majesty’s reign, in the ecclesiastical commission, till this hour; and therefore warranted by statute. 8, If it be said that it be against law, reason, and charity, for a man to accuse himself, quia nemo ienetur seipsum prodere aut propriam turpitudmem revelare, I answer, that by all charity and reason, Proditus per denundationem alterius sive per famam, tenetur seipsum ostendere, ad evitandum scandalum, et seipsum pur gandum. Prælatus potest inquirere sine prævia fama, ergo a fortiori delegati per principem possunt; ad hæc in istis articulis turpitudo non inquiritur aut flagitium, sed excessus et errata clericorum circa publicam functionem ministerii, de quibus ordinario rationem reddere coguntur. (The purport of our prelate’s meaning seems to be, that although no man is obliged to inform against himself, yet, if informed against by others, he is bound to come forwards, in order to avoid scandal, and justify himself; that a bishop may institute an inquiry upon a previous fame, much more delegates appointed by the sovereign; and besides, that in these articles no inquiry is made as to tur-' pitude or criminality, but as to the irregularities and errors of the clergy, in matters relating to their ministerial functions, an account of which they are bound to render to their ordinary) 9. 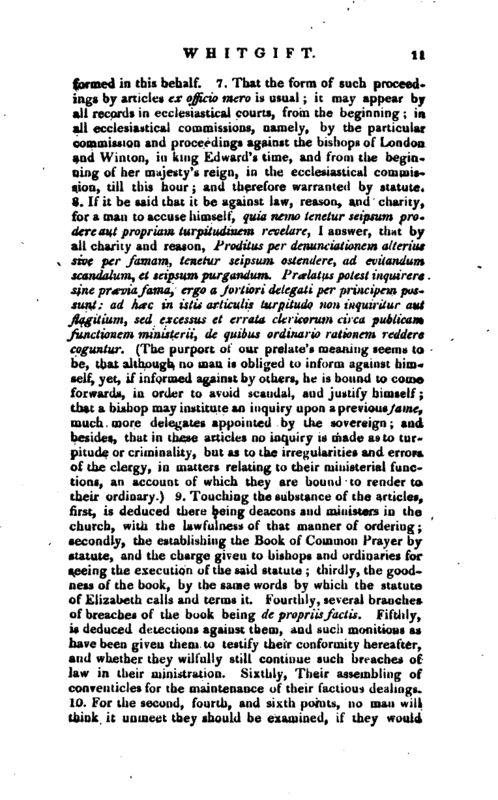 Touching the substance of the articles, first, is deduced there being deacons and ministers in the church, with the lawfulness of that manner of ordering; secondly, the establishing the Book of Common Prayer by statute, and the charge given to bishops and ordinaries for seeing the execution of the said statute; thirdly, the goodness of the book, by the same words by which the statute of Elizabeth calls and terms it. Fourthly, several branches of breaches of the book being de propriis factis. Fifthly, is deduced detections against them, and such monitions as have been given them to testify their conformity hereafter, and whether they wilfully still continue such breaches of law in their ministration. Sixthly, Their assembling of conventicles for the maintenance of their factious dealings. Jo. For the second, fourth, and sixth points, no man will think it unmeet they should be examined, if they would | have them touched for any breach of the book. 11. The article for examination, whether they be deacon or minister, -ordered according to the law of the land> is most necessary; first, for the grounds of the proceeding, lest the breach of the book be objected to them who are not bound to observe it; secondly, to meet with such schismatics, whereof there is sufficient experience, which either thrust themselves into the ministry without any lawful calling at all, or else to take orders at Antwerp, or elsewhere beyond the seas. 12. The article for their opinion of the lawfulness of their admission into the ministry is to meet with such hypocrites as, to be enabled for a living, will be content to be ordained at a bishop’s hands, and yet, for. 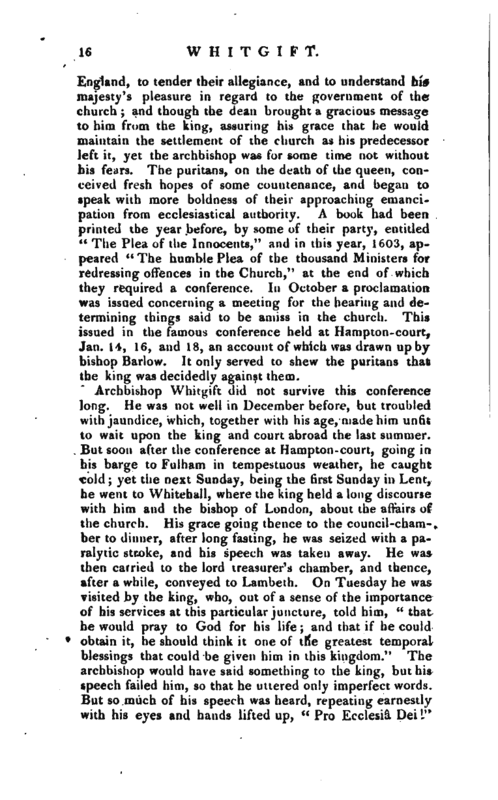 the satisfaction of their factious humour, will afterwards have a calling of Certain brethren ministers, with laying on of hands, in a private house, or in a conventicle, to the manifest slander of the Church of England, and the nourishing of a flat schism; secondly, for the detection of such as not by private, but by public speeches, and written pamphlets spread abroad, do deprave the whole order ecclesiastical of this church, and the lawfulness of calling therein; advouching no calling lawful but where their fancied monstrous signorie, or the assent of the people, do admit into the ministry. 13. The sequel that wo^ild follow of these articles being convinced or proved, is not -so much as deprivation from ecclesiastical livings, if there be no obstinate persisting, or iterating the same offence; a matter far different from the bloody inquisition in time of popery, or of the six articles, where death was the sequel against the criminal. 14. It is to be considered, what encouragement and probable appearance it would breed to the dangerous papistical sacraments, if place be given by the chief magistrates ecclesiastical to persons that tend of singularity, to the disturbance of the good peace of the church, and to the discredit of that, for disallowing whereof the obstinate papist is worthily punished. 15, The number of these singular persons, in comparison of the quiet and conformable, are few, and their qualities are also, for excellence of gifts in learning, discretion, and considerate zeal, far inferior to those other that yield their conformity; and for demonstration and proof, both of the numbers, and also of the difference of good parts and learning in the province of Canterbury, there are but — hundred that refuse, and — thousands that had yielded their conformities. 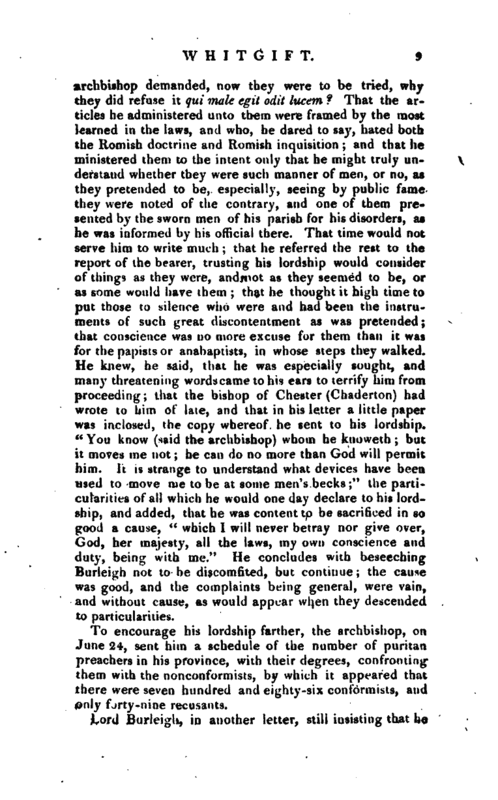 | These sentiments of the archbishop, although the detail of them may seem prolix, will serve to shew the nature of that unhappy dispute between the church and the puritans which, by the perseverance of the latter, ended in the fatal overthrow both of church and state in the reign of Charles I. 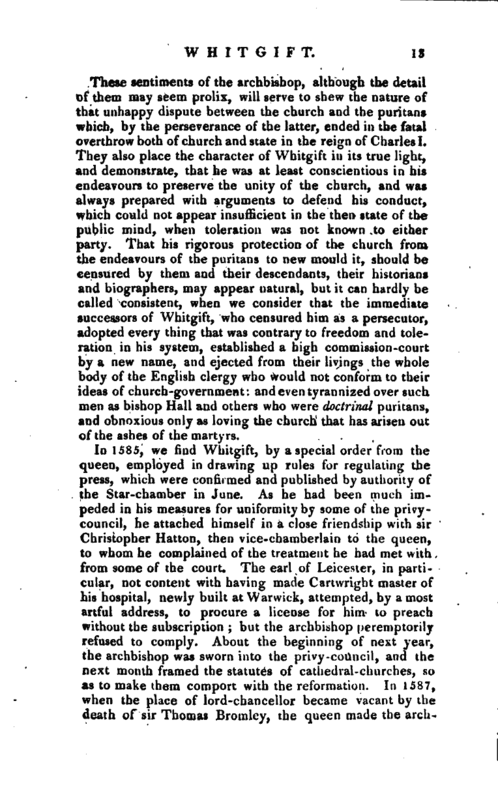 They also place the character of Whitgift in its true light, and demonstrate, that he was at least conscientious in his endeavours to preserve the unity of the church, a,nd was always prepared with arguments to defend his conduct, which could not appear insufficient in the then state of the public mind, when toleration was not known to either party. That his rigorous protection of the church from the endeavours of the puritans to new mould it, should be censured by them and their descendants, their historians and biographers, may appear natural, but it can hardly be called consistent, when we consider that the immediate successors of Whitgift, who censured him as a persecutor, adopted every thing, that was contrary to freedom and toleration in his system, established a high commission-court by a new name, and ejected from their livings the whole body of the English clergy who would not conform to their ideas of church-government: and even tyrannized over such men as bishop Hall and others who were doctrinal puritans, and obnoxious only as loving the church that has arisen out of the asbes of the martyrs. In 1585, we find Whitgift, by a special order from the queen, employed in drawing up rules for regulating the press, which were confirmed and published by authority of the Star-chamber in June. As he had been much impeded in his measures for uniformity by some of the privycouncil, he attached himself in a close friendship with sir Christopher Hatton, then vice-chamberlain to the queen, to whom he complained of the treatment he had met uith from some of the court. The earl of Leicester, in particular, not content with having made Cartvvright master of his hospital, newly built at Warwick, attempted, by a most artful address, to procure a license for him to preach without the subscription; but the archbishop peremptorily refused to comply. About the beginning of next year, the archbishop was sworn into the privy-council, and the next month framed the statutes of cathedral-churches, so as to make them comport with the reformation. In 1587, when the place of lord-chancellor became vacant by the death of sir Thomas Bromley, the queen made the | archbishop an offer of it, which he declined, but recommended sir Christopher Hatton, who was accordingly appointed. In 1593, Dr. Bancroft published his “Survey of Discipline,” in which he censured Beza’s conduct in intermeddling with the English affairs in respect of church-government; upon which the latter complained of this usage in a letter to archbishop Whitgift, who returned a long answer; in which, he not only shewed the justice of Dr. Bancroft’s complaint, but further also vindicated Saravia and Sutcliffe, two learned men of the English church, who | had written in behalf of the order of episcopacy, against Beza’s doctrine of the equality of ministers of the gospel, and a ruling presbytery. In 1594, fresh complaints being made in parliament of the corruption of the ecclesiastical courts, the archbishop made a general survey of those courts, and their officers; and the same year he put a stop to the passing of some new grants of concealed lands belonging to the cathedrals. This year (1595) he obtained letters patent from her majesty, and began the foundation of his hospital at. Croydon. 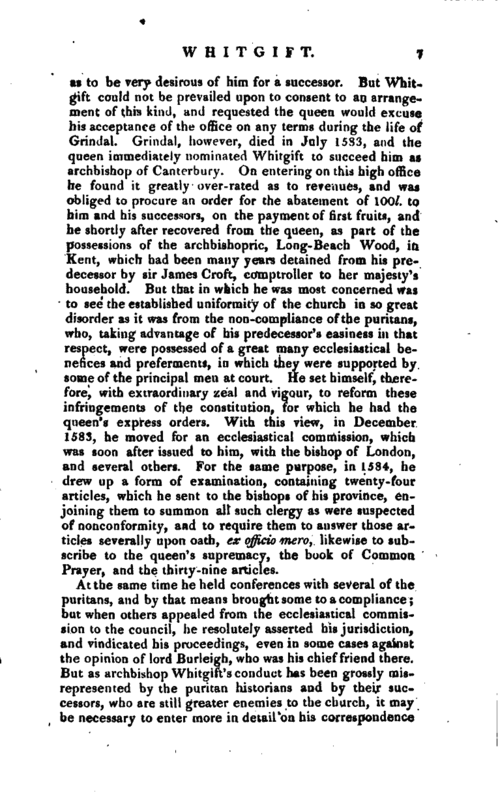 The same year he protected the hospital of Harbledown, in Kent, against an invasion of their rights and property: and the queen having made him a grant of all the revenues belonging to the hospital of Eastbridge, in Canterbury, he found out, and recovered next year, some lands fraudulently withheld from it. In 1599, his hospital at Croydon being finished, was consecrated by bishop Bancroft. 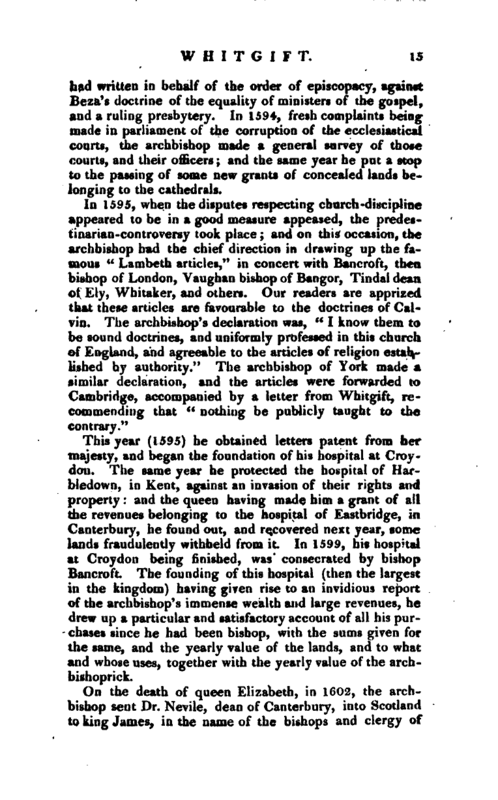 The founding of this hospital (then the largest in the kingdom) having given rise to an invidious report of the archbishop’s immense wealth and large revenues, he drew up a particular and satisfactory account of all his purchases since he had been bishop, with the sums given for the same, and the yearly value of the lands, and to what and whose uses, together with the yearly value of the archbishoprick. He was interred in the parish church of Croydon, where a monument was erected, with an inscription to his memory. He is described as being in person of a middle stature, a grave countenance, and brown complexion, black hair and eyes. He wore his beard neither long nor thick. He was small-boned, and of good agility, being straight and weli shaped in all his limbs, to the light habit of his body, which began somewhat to spread and fill out towards his latter years. His learning seems to have been confined to the Latin language, as Hugh Broughton often objected to him, nor does he appear to have been much skilled in the deeper points of theology; but he was an admired and diligent preacher, and took delight in exercising his talent that way; it was, however, in ecclesiastical government that his/brte lay, in the administration of which he was both indefatigable and intrepid. It is by his conduct in this that | his character has been estimated by posterity, and has been variously estimated according to the writer’s regard for, or aversion to, the constitution of the church of England. In his expences it appears that he was liberal and even munificent. Both when bishop of Worcester and archbishop of Canterbury, he took for many years into his house a number of young gentlemen, several of quality, to instruct them, as their tutor, reading to them twice a day in mathematics and other arts, as well as in the languages, giving them good allowance and preferments as occasion offered. Besides these, he kept several poor scholars in his house till he could provide for them, and prefer them, and maintained others at the university. His charitable hospitality extended likewise to foreigners. He relieved and entertained at his house for many years together several distressed ministers (recommended by Beza and others) out of Germany and France, who were driven from their own homes, some by banishment, others by reason of war, shewing no less bounty to them at their departure. Sir George Paule assures us, that he remitted large sums of his own purse to Beza. Strype’s Life, fol. Life by sir George Paule, 1699, 8vo. The same with notes in Wordsworth’s Biography. Biog.Brit. Fuller’s Worthies, Church History, and Abel Redivivus.